Elbert Ray Hinshaw1,3,4 [Ray Hinshaw3,5]. 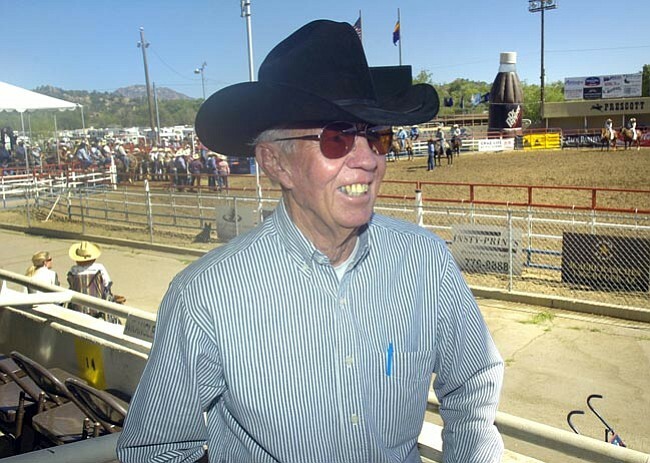 PRESCOTT - When the Prescott Frontier Days World's Oldest Rodeo got off and running early Friday morning with slack competition, Ray Hinshaw observed from near the top of the grandstand. The 84-year-old Hinshaw had the first shift as the on-site veterinarian. But most, if not all, of his duty this week will be much like Friday: be there and be ready for a situation that probably won't come. Hinshaw's twin brother, Rex, will also be on duty at times during the rodeo. All in all, nine vets will be on hand during competition. "It's a real easy job," Hinshaw said with a chuckle. 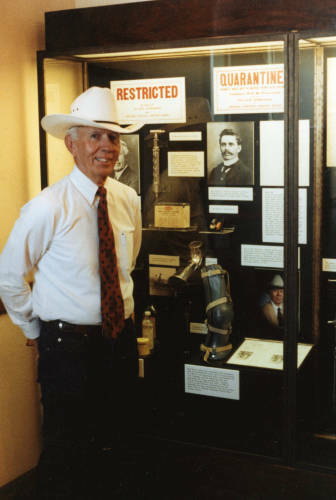 He has been working at the rodeo since he retired in 1992 at about the time the PRCA required a veterinarian be in attendance at all performances. Over that time, Hinshaw said he has only needed to put a horse down once. On that occasion, a pair of horses ran into each other. "It's very seldom (that we're needed)," Hinshaw said. "It's so infrequent like what happened with Barbaro." Horses are very delicate and can't deal with a great deal of discomfort, according to Hinshaw, unlike cattle. "If (cattle) are sore, you don't use them," Hinshaw said. "You lay 'em up. You don't kill 'em." Bill McAnulty runs the health care unit. This is his 25th year at the World's Oldest Rodeo. "Since I've been here in 25 years, we've had about three calves that had leg problems and one or two horses with a leg problem," McAnulty said. "We're lucky I guess. We turn out a lot of animals here. "We just wait around in case (an animal) gets hurt and we're here to take care of them." The staff also does their best to keep the animals away from the heat and keep them watered down. Other than that, it's just a matter of waiting for a worst-case scenario that hopefully never comes. "Sometimes the care for the animals is a little bit better than the care for the cowboys," General Manager J.C. Trujillo said. "The rodeo people are really into the humane factor of the care for the animals." Hinshaw talked about how valuable the animals are and their intrinsic value to the owners. He and his brother Rex have over 100 years of veterinary experience between them tending to these animals. 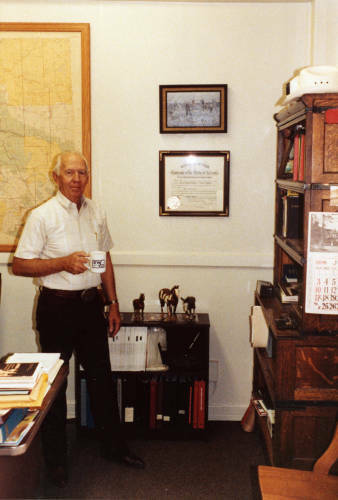 Ray moved from Buckeye to Humboldt in 1969, worked at Turf Paradise for a number of years, with the State and at a number of other stops along the way. He said he has always loved the rodeo and wouldn't rather be doing anything else. "I always felt that way about veterinary medicine," Hinshaw said. "I don't know what I would have done if it wasn't for this." Contribution from Rex Timothy Hinshaw. Contribution from Elbert Ray Hinshaw. 1940 census, Boulder, Boulder County, Colorado; roll T627-457, ED 7-45, page 11B-12A, line #80, household #320. 1930 census, Boulder, Boulder County, Colorado; roll T626-231, ED 49, page 14A, line #29, dwelling #363, family #419. U.S. Public Records Index, 1950-1993, Volume 1; http://www.ancestry.com.